I was life drawing yesterday using watercolours, I try my best to capture the pose in 5 minutes or whatever the decided time is. I of course run out of time which is okay as everyone does. I have gotten into the habit of playing with these sketches the morning after, I start the day with a strong cup of coffee and I try to improve the quick watercolours I did the night before. It’s fun and just like kids I learn a lot by just playing around. Sunday fun and a little extra work Monday morning hence the date on the painting being the 5th of Februari. I enjoyed the long – one pose session at konstnärshuset last Sunday. The model (Sofie) was excellent and stayed perfectly still throughout. I am so looking forward to having her at Meldrum Kroki very soon, she is very popular with the local life drawing tribe. I love the power of the internet, it looks as though this particular watercolour has a buyer already, always nice to make a sale. Click image below for larger size. I visited a new studio in Hökarängen to do some life drawing this week. 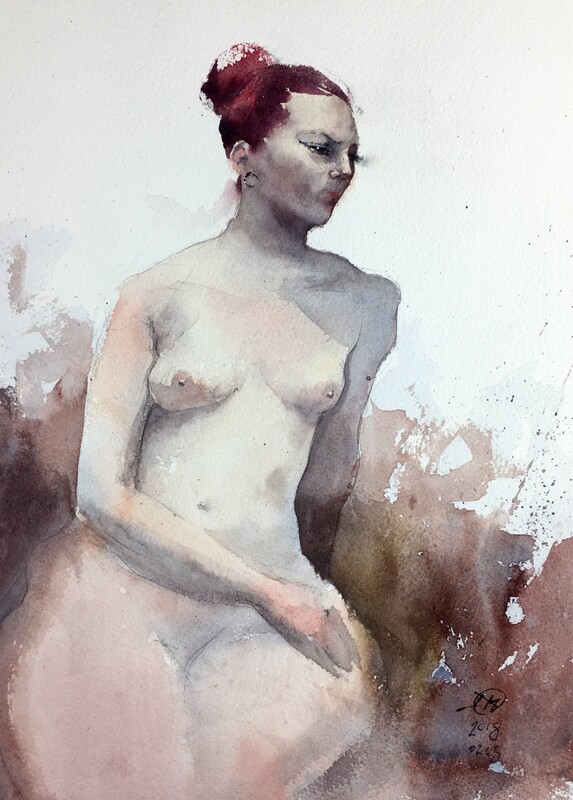 It was really enjoyable, I especially liked the fact the model had just one pose after the warming up period, we then had 20 minute sessions which allowed me to experiment with 3 watercolours which took about 30 minutes each. There was some sketching to warm up but I mostly painted. Lars, was the name of the model. Only one negative experience, I forgot my pencil case with all my favourite pencils and a small pocket knife. I rang the next day to the studio but they were gone.